Analyses from CAP and others have found that many power plants have already installed or have under construction the pollution-control technologies that can significantly reduce mercury as well as other pollutants. Plants in 17 states are already required to address their mercury pollution, regardless of federal requirements. These measures vary in stringency, with some of them imposing more protective mercury-emissions limits on coal-fired power plants than the EPA has proposed. 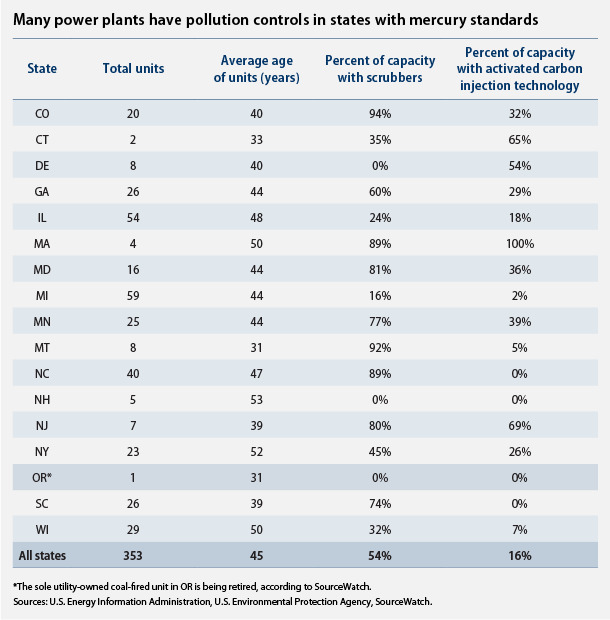 Many of the power plants in these states have already installed the equipment necessary to reduce mercury pollution, although most state safeguards have yet to take effect. 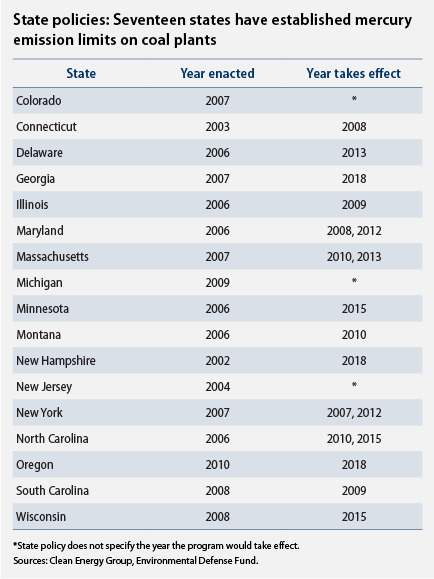 A CAP analysis of the coal-fired power plants in these 17 states found that more than half of their total electricity-generation capacity has pollution controls that can reduce mercury. In response to a 2006 Minnesota state mercury law, Xcel Energy agreed to install an ACI system on the 900 MW Unit 3 at its Sherburne County plant (Sherco 3). The unit, which burns low-sulfur western coal from Montana and Wyoming, already had a dry scrubber operating to reduce SO2 emissions. Once tuned to the unit’s operational specifications, the ACI system should reduce the plant’s mercury emissions by about 90 percent. The system was completed in December 2009 for a total capital cost of $3.1 million, or $3.46/kW. Wisconsin Power and Light installed ACI controls at its Edgewater Generating Station. The system was operational in the first quarter of 2008. Edgewater Unit 5 is a 380 MW plant that fires sub-bituminous western coal and employs an “electrostatic precipitator” to capture fine particles. The total installed costs of the Edgewater Unit 5 ACI system were approximately $8/kW, or approximately $3.04 million. Both of these power plants installed these controls to comply with the Minnesota and Wisconsin mercury-reduction laws. These plants should find it relatively inexpensive to meet the pending federal standards.
. The mercury capture rates depend on the type of scrubber, and whether there are controls for NOx and particulate matter, or soot.